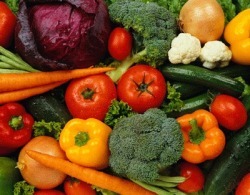 Every basket is prepared with fresh variety of veggies and fruits. Any item(s) not desired can be replaced with extra of another item OR a deduct from the cost of basket. Custom orders are only available with case quanties and prepaid week of scheduled delivery. In regards to basket sizes, many start with the small size. Most with children will change to large basket. Large baskets have greatest value and is just right for families. Pickup baskets every other week at the allowable times. Notice must be given if skipping a scheduled delivery, see guidelines for information.